The team arrived safely to Kampala last night. When we walked into our guest house we thought that perhaps our trip had taken 3 months instead of a day and a half… in the den stood a fully decorated Christmas tree. You have to love Uganda. After a visit by the plumber to fix one of the toilets we settled in to get our first night’s sleep. This morning we traveled by boat to Bethany Village. Francis the manager of the Village gave us a tour. BV is a community for orphans. They currently have 8-10 homes with 12-15 children. Each home is run by the house mother. They have a school on campus and a new medical clinic. The children do chores, help in their home garden as well as the community Village garden. Children as well as the house parent and the “home” itself is paid for through sponsors. It is a testimony to what the global body of Christ can do. After a really great lunch in Kampala we headed to Buloba. 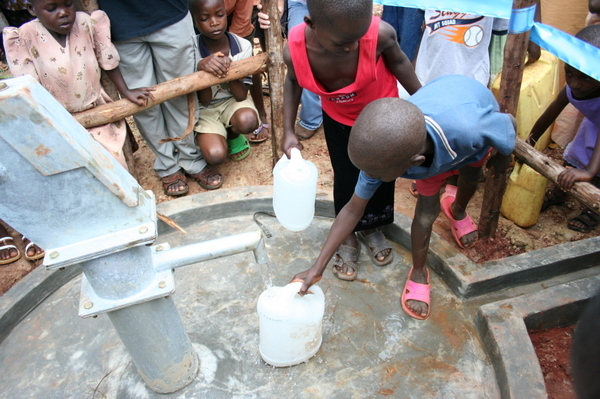 What I had not told the team until we arrived last night was that the well was to be dedicated today! They were waiting for our arrival to commission the well officially. When we arrived at the church we were able to meet Pastor Isaac and his wife. And the chairman (Mayor in US terms) of Buloba was there as well. 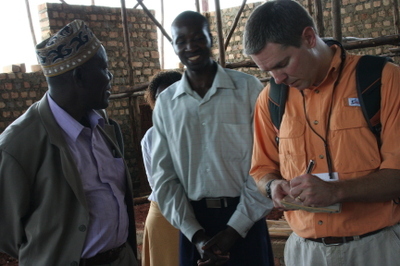 He thanked us for our work in Buloba for the church building as well as the gift of the well. I find his thanks to be the work and favor of the Lord. He is obviously Muslim. We gathered in the new building (currently under construction) as thank you’s were shared. We signed the chairman’s journal to document our visit and work. Then we walked down to the well. They drilled in front of the church property but were not able to find water there so they moved to the secondary site just behind the church. Pastor Eva said that the well had to sit for 2 weeks until they could use it so this would be the first day it has been used! They had tied it off with Big blue ribbons- Rusty shared from the John 4 passage of Jesus’ encounter with the woman at the well then I prayed. The ribbon was cut and the pumping began. Kids had brought their jugs to get water and I think some of them were more excited than the adults. We were told that the water wa s clean enough that they will be able to use it straight from the pump. Some will still boil it- more out of habit than need. They drilled down 61 meters to find water (for you engineer types). The ladies have been hard at work making baskets, trays, necklaces and bags you can use for beach bags or grocery shopping bags. I don’t have pictures of the final product today but will have some tomorrow. I cannot convey the joy my heart felt to see the people in Bulboa. To see water flowing out of that hand pump. To see the hope that these friends have. The excitement and pride they have for what God is doing in their midst. Tomorrow we will be spending most of the day in Buloba and showing the Jesus film. Pray for the team as we continue to just love on these friends. For God’s love to be seen and understood tomorrow night during the Jesus Film. Pray for the things that currently war against the church. I will share a little more about that tomorrow. My post tomorrow will be much later since we won’t arrive back until late. I felt like it took you guys 3 months to arrive :) kept waiting for a post to see how it was going, so cool that you guys were able to be there for the ribbon cutting of the well. 61 meters = 200.131234 feet. That's a deep hole. Wow.